How To Split Non-Empty Partitions When A Clustered Columnstore Index Exists on The Table - bzzzt! Another pithily titled blog post, but this one revisits the feature of SQL Server 2014 that piqued my interest the most: Clustered Columnstore Indexes. I’ve been working with Clustered Columnstore Indexes for the past few months and recently a colleague had to split a non empty partition, only for the error message below to appear. Msg 35346, Level 15, State 1, Line 390 SPLIT clause of ALTER PARTITION statement failed because the partition is not empty. 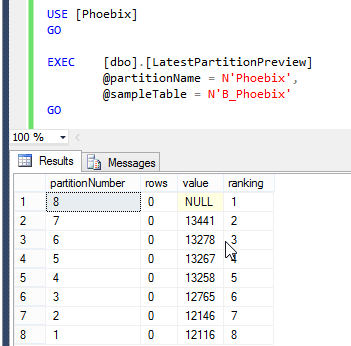 Only empty partitions can be split in when a columnstore index exists on the table. Consider disabling the columnstore index before issuing the ALTER PARTITION statement, then rebuilding the columnstore index after ALTER PARTITION is complete. This database has two tables sharing the same partition schema, which itself is on its own secondary filegroup. The script will create 7 partitions with distinct ranges. Let’s populate some of those partitions with data. This is going to load into staging tables and switch the tables into the partitions, so we can be confident that everything is set up correctly. Now we have data loaded, we need a method of viewing the partitions. The script below will create a stored proc that we can run to view the data by partition. This sproc is modified from my SQL Server Partitioning 101 post. Ok great, we’ve now got 2 partitioned tables stored as CCI. Now what happens when we try to split a non empty partition? Ok, we’ve got the same error message as before; this is expected as we know we cannot split non-empty partitions on tables that are stored as CCI. The syntax for disabling an index is straightforward, and we need to disable indexes on both tables. Ah, looks like disabling does not solve the issue. This is actually documented in the ‘Limitations and Restrictions’ section regarding altering partitions on Books Online. So this somewhat contradicts the suggestion in the original error message. The error message I got is in full below. Msg 7725, Level 16, State 1, Line 398 Alter partition function statement failed. Cannot repartition table ‘B_Phoebix’ by altering partition function ‘pfnPhoebix’ because its clustered index ‘B_Custard’ is disabled. So, what are we to do? Well the first thing we should do is enable the index. Then we can look into workarounds. There’s no way around it, we need to drop the index. Or do we? Seeing as we’re using partitioned tables here, the pragmatic, and faster, way of splitting a non-empty partition is to switch out the partition into a staging table, split the now empty partition, and switch the data back in. Really, it’s a case of modifying the import process above. If you get any errors from running the script below, make sure you have rebuilt the indexes after disabling them. At this juncture we have a staging table that is exactly the same as the main table, so we can now switch the non empty partition we want to split into this new table. We’re nearly done. All we need to do is switch in the staging table and we’ll be back the way we were. Execute the sproc one last time to verify that the data has been switched in. So now we’ve been able to split the partition without having to drop the index. Great! And thanks to partitioning being so quick, it was a swift operation. It would get more complicated if you wanted to split the data in one partition into two partitions as you’d need to split the data out of the staging table into two staging tables, which won’t be as quick an operation as the example above. At any rate, the example above shows that you can avoid having to drop clustered columnstore indexes on tables in order to split non-empty partitions.